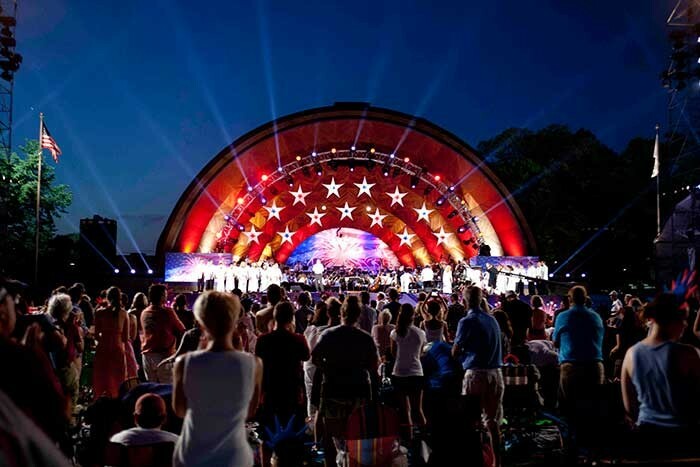 It wouldn’t be the Fourth of July without the "Boston Pops Fireworks Spectacular", and Robert Juliat Cyrano followspots helped light up the annual event, which was televised live from the Charles River Esplanade. The free outdoor concert marked its fortieth anniversary. The event draws over 500,000 people each year to the Boston and Cambridge sides of the Charles River. Audiences wait with anticipation to hear the Boston Pops’ now classic rendition of Tchaikovsky’s "1812 Overture" with real cannons, church bells and fireworks; "The Stars and Stripes Forever" with ceremonial American flag drop and confetti shot; and watch a final explosive fireworks array. This year musical guests included Susan Tedeschi, Ellis Hall, Howie Day, Ayla Brown, and the Tanglewood Festival Chorus. Keith Lockhart conducted the Boston Pops Orchestra. "The event was a lot of fun to be part of," says lighting designer Christopher Landy of Vibrant Design LLC. "Summer shows like this one can be challenging because they start in the daylight and end at night, so you need to use spots that are able to compete with the sun." Landy utilized two Cyranos obtained from Capron. "The talent looked great," Landy says. "The spots fields are perfectly even and consistent and they’re very easy to operate – which is more important than you think. It makes it easy to balance and easy for the operator and myself to subtly tweek levels." Cyrano is a compact and efficient 2500-watt HMI followspot with a high-performance quartz condenser optical system. It features a 100% closing iris in a removable cassette; 100% closing dimmer; B-size gobo holder; and 6-way boomerang colour changer with removable filter frames. Landy reports that he uses Robert Juliat lighting exclusively these days – even on less spectacular shows. "When I am lighting A-List talent, I need an A-List fixture. Juliat provides that," he says. "The camera sees every imperfection and flutter; an inconsistent field is not an option. In fact, on a recent comedy shoot, I had to swap out three competitors’ spots after the first day of taping. They just weren’t cutting it. With the Juliat spots it was like a new show. Shows with Juliats equal happy clients."